Destiny can be played on your own. But like so many games lately, it is an experience best played with others. If you don’t have a group of friends to play with on a regular basis, the game will match you with others. However, even the studio knows that matchmaking isn’t ideal. Bungie has always enjoyed a strong, active symbiosis with the player. Even when the community was hosted offsite, the Bungie Weekly Update began as a Friday afternoon strafing run on fan forums. There are Team Leads at the highest levels of the Bungie org whose origin stories started as players of our games. As far back as Myth, the community has enhanced Bungie games with their own contributions. They’ve been a crucial part of the development process for longer than most of us can remember. The community always engineers the best solutions for bringing players together. While Matchmaking is a great resource for introducing total strangers who can share a Crucible match or a Strike, we believe there’s no substitute for a pre-made team. 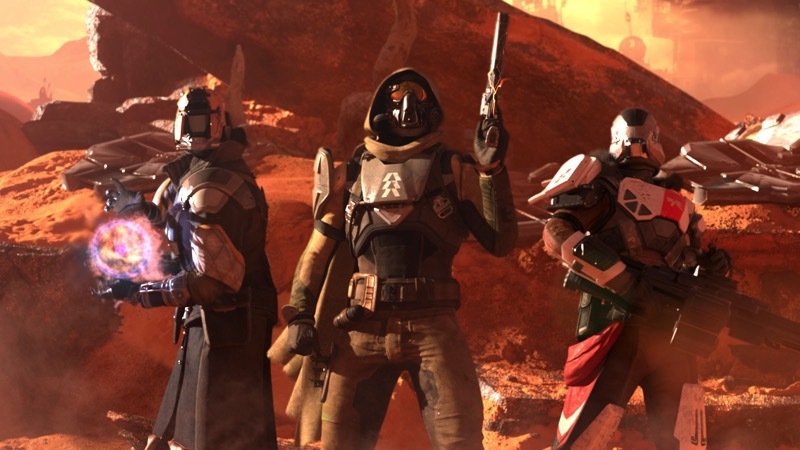 The most challenging activities in Destiny require communication and teamwork. When like-minded players with complimentary [sic] play-styles seek each other out and make an expressed commitment to work together, the results are so much better than when they meet anonymously through a matchmaking algorithm. In our experience, enabling smaller clusters of players to support each other is far more effective than trying to create a system that works for everyone. I think this is fairly common sense. Of course people who get along well and have complementary play styles will have a better experience than those who play with randoms. I think this is the ultimate problem in the online gaming space – an increasing number of games have co-op or multiplayer elements. However, not everyone has a reliable group of friends to play with on their platform of choice. As a result, games need to have algorithms to match people together. Unfortunately, that experience will never be as good as playing with actual people you know and like. This problem isn’t unique to Destiny – the same goes for Evolve and even to a certain degree with Helldivers. Any game that requires teamwork will be better if you actually feel like a team. Next article Just how was Paul Walker's performance completed for FURIOUS 7?